Your biller wanted to make paying bills easier for their customers, but didn't have the electronic presentment and payment systems required to display, safely process and store financial information. Your biller chose Invoice Cloud because it is easy to use, and the security is the strongest available. All the data collected is double encrypted and stored on secure servers. The data is not sold or released for any purpose other than to complete transactions. It is very simple. Here are the 3 steps taken by customers: Customer receives email notification or accesses account via the Biller website by clicking on the "View or Pay Your Bill" button. Customer locates and vwhat areiews invoice and either enters payment information for a One Time Payment or registers to schedule a payment. Customer receives an email confirmation with their payment amount and payment process date. Can I use an Apple/Mac to use the service? By registering, you have access to all of your invoices regardless of type and all of the features of the payment portal. These features include the ability to view all current invoices, see previous invoices and payment dates, update your profile information, access the online customer service system, go paperless (if bill type allows), schedule payments for a specific date, and sign up for Auto-Pay. You also avoid having to enter your payment information each time you pay a bill. When you receive an email notification that your bill is ready to be paid, simply click on the "View Invoice or Pay Now" button. You will be directed to Biller's "Pay and/or View Bills Online" site, powered by Invoice Cloud. Once there, you will be given the opportunity to register or make a One Time Payment. If you choose to register, you will be asked to provide a password and accept the terms and conditions to use the system. The payment information you enter in your profile will then be securely encrypted and saved for your next visit. You can go directly to the biller's website and click on the "Pay or View your Bill" button. You will then be directed to the Biller's "Pay and/or View Bills Online" site, powered by Invoice Cloud. Once there, you will need to locate your account and be given the opportunity to register or make a one time payment. If you choose to register, you will be asked to provide a password and accept the terms and conditions to use the system. The payment information you enter in your profile will then be securely encrypted and saved for your next visit. Please scroll down on the page to view the matching items at the bottom. Otherwise, try re-reading the instructions for the search criteria. You may be entering more than one search criteria for Real Estate or Personal Property bills, which may only require one out of two fields. Utility bills may require a service address as confirmation. It must be entered exactly as indicated on printed bill. Under "How would you like to pay" click on the drop-down box and choose EFT Check. Once you have registered, you will need only your email address and password to log in. To login the first time you use the system, you will need your account number or customer ID from your bill. The "locate your bill" screen gives instructions regarding the required information. You should click on "Forgotten Password?" at the bottom of the login screen. You will need your account number and email address to retrieve your password. If you're unable to locate this information, you may call 860-582-7431, and after verifying your identity, the Bristol Water Department can provide you with the information. There are two ways that payment responsibilities can be shared. If the other payer is part of your household, you may choose to share your login information with that individual. In a situation where personal financial data is not shared, you may forward your email notification to the individual, who will then click on the "View or Pay Now" button and elect to make a one time payment. They will need to enter their name, email address, address and payment information. They will receive the payment confirmation. You can verify their payment by viewing the invoices in your account. You can pay by credit or debit card, or you may issue an electronic check from your bank account (checking or savings). Please check your biller's website for the credit and debit cards that are eligible. Yes, your bill can be paid in any of the following ways: Email notification based payment - click the "View Invoice or Pay Now" button in your email. Web based online payment - login to online bill pay via Biller's website. Pay in person at our office located @ 119 Riverside Ave. Paper check - sent by whatever means you choose, including US Postal Service (note: many paper checks today are converted into electronic transactions once they are received). If I don't have email can I still process an electronic payment? No, but you can mail your check in and it can be converted into an electronic payment transaction. To complete the online payment process yourself, you will need an email address so that the system can deliver your payment confirmation. If you do not have an email address, you can obtain a free email account from any of the following services: yahoo.com, hotmail.com, or gmail.com. You can pay your current monthly bill and past due bills from your Biller. There are no signup costs, subscription fees or transaction fees. There are fees imposed for returned payments, and your bank may charge you a fee based on the bank's fee schedule. How long does it take for an electronic check/EFT (electronic funds transfer) transaction to process if I pay online? EFT transactions typically take 48 - 72 hours to settle. Paying online is only half of the benefit, by going paperless and not receiving paper invoices, you can increase the effect you can have on the environment. There are several ways reducing paper consumption helps the environment, including saving trees and using less gas. According to the PayItGreen AllianceTM, if one in five households were to switch to electronic payments, statements and bills, we could collectively save 1.8 million trees each year and avoid using 103 million gallons of gasoline to mail bills, statements, and payments. If you'd like to be part of that one in five, just sign up to "go paperless" in your account under my profile, paperless options. Why did I get a paperless registration email? Going paperless is a two-step process, after receiving the paperless registration email, you must click the Confirm button in the email to complete the process. If you prefer not to go paperless, simply do not complete registration (by clicking in the email). You will get one reminder email, but if you don't complete the registration at that time, the paperless enrollment will be cancelled. You may also go to Paperless Options in your account profile and click "cancel registration". You can make payment or review your account 24 hours a day, 7 days a week. It is always a good idea to pay or schedule a payment at least a few days before the due date to allow for processing time. Yes, simply login to your account and select "View paid or closed invoices". If you are a registered customer, you will receive an email notification. Yes, you can make installment payments on bills by using a simple self-service selection called Flex-Pay. Your plan will include 6 equal payments and you can decide the plan start and end dates and the payment method, either credit card or e-check. Once your flex-pay schedule is made, you will receive an email confirmation of the schedule. Individual email reminders will be sent to you three days prior to each payment being made. You may cancel a Flex-Pay schedule at any time during the payment period, however only future payments will be cancelled. For example, if you have scheduled 6 installments and after the first two payments have been processed, you decide to cancel the schedule, only payments 3, 4, 5 & 6 will be affected. At that point, you can create a new Flex-Pay schedule for the remaining amount due. Steps to creating a customized payment plan: You must be registered to make a flex-pay schedule. Once signed in, select "View or Pay Open Invoices" under My Account. Select the invoice, by clicking in the right side box (a checkmark will appear), click pay selected. Under "When would you like to pay?" you will see 3 payment options, flex-pay, today and schedule a payment. Select flex-pay. Add a payment method by clicking on either the new bank account or new credit card button and enter your payment information (or select existing method). Click continue to proceed. On the next screen, you will enter the payment schedule timeframe and press "Create My FlexPay Schedule." Review the schedule and press continue. Finally, you will review the payment information and schedule and click "Schedule My FlexPay Payments." Three days prior to each payment being processed, you will receive an email notification. What is Auto-Pay? If you elect to opt in to Auto-Pay, it means that your bills will be paid automatically on their due dates using your default credit card or bank account. This will avoid any late fees and free you from having to remember when to pay. Yes, simply go into your profile and uncheck the auto-pay box that you had previously checked when you elected to opt into Auto-Pay. I signed up for Auto Pay but do not see any information under "My scheduled payments." The Auto Pay date will not appear under scheduled payments. Auto Pay will be debited from the customer's account on the due date. What are scheduled payments? Scheduled payments are scheduled individually by you for each bill on your specified date. A partial payment occurs when only part of an invoice is paid and may apply if your biller has elected to allow partial payments. Please contact your biller's office for more information. You will need to contact your bank and cancel your automated or scheduled payment before the payment is due (typically payments are made a couple days in advance of the due date, so don't wait until the last minute). If you feel that this fee has been assessed in error or you would like more information about late fee charges, please contact 860-582-7431. I received an email stating "Thank you for going paperless," but I DID NOT sign up for paperless! You can access the customer portal via Biller's website and view the bill there. If the website is down or inoperable, please call Invoice Cloud customer service at 877-256-8330 x2700. 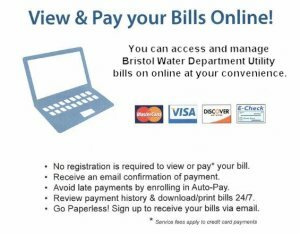 You and the Bristol Water Department's authorized staff. No one will have access to your financial information as all check routing numbers and credit card numbers are truncated, so you never have to worry about security. As a security precaution, we don't even show your full financial information back to you.